SIKORA is a manufacturer and global supplier of advanced measuring technology for the metals, hose and tube, wire and cable, optical fiber and plastics industries. At METEC in Düsseldorf from June 25 to 29, 2019, the company presents a broad portfolio of innovative systems for non-destructive quality control and process optimization of steel tubes, strips and plates at its booth 3A58. 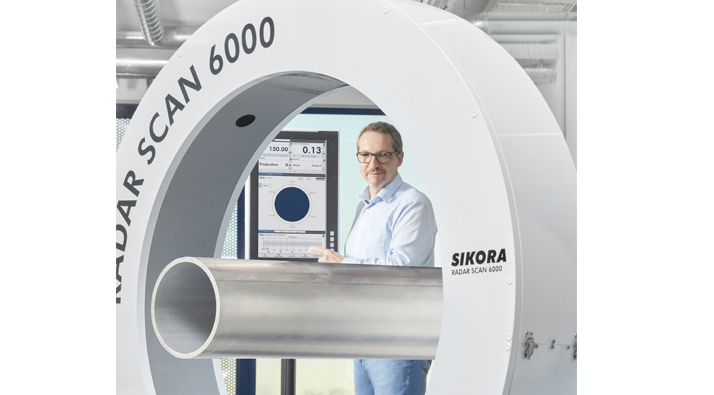 With the RADAR SCAN 6000, SIKORA presents a system for non-contact inline measurement of the diameter and ovality of metal tubes and rods. The system is based on progressive, high-resolution radar technology and records measuring values over 360° of the circumference of the product to micron accuracy. The measurement is carried out by radar transceivers simultaneously from several directions and is insensitive to heat, dust and steam. Typical measuring ranges of 300 to 2,500 mm are covered. The RADAR SCAN 6000 requires no coupling media and continuously delivers precise measuring values, which lead to a high reliability and availability for the user. Due to the slim design, the system can easily be integrated in the production process for hot as well as cold measurement. The technology measures regardless of the surface roughness in typical tube applications. The measuring values are clearly displayed graphically as well as numerically on the display of the processor system ECOCONTROL 6000. Furthermore, extensive trend and statistical functions as well as comprehensive data logging are available. The RADAR SCAN 6000 contributes to the highest product quality, process optimization and cost saving during tube manufacturing. Another highlight at the SIKORA booth is the PLANOWAVE 6000 M, a non-contact measuring system that is used for non-destructive thickness measurement of slabs, strips and plates. The system offers a precise thickness measurement independent of material, temperature and surface of the product. An external calibration on the material is not needed. The measurement of the product is also based on radar technology. Transceivers above and below the material continuously send and receive frequency modulated millimeter waves. The thickness – typically centerline thickness – of the product is precisely determined from the runtime difference. By using a traversing set of transceivers, the cross-section profile of the product can be optionally determined. The PLANOWAVE M is designed for a typical measuring range of up to 500 mm. The system is used directly in the production line or at the end of the line for final quality control. This system is also combined with the display and control system ECOCONTROL 6000 for the visualization of the measuring values, the display of trend and statistics as well as data logging. 500 mm. They are free of wearing parts, keep their precision during the entire operating time and no calibration or maintenance work is necessary. The measuring values are clearly displayed on the monitor of a processor system of the ECOCONTROL series. SIKORA also presents the LASER Series 6000. These devices complement SIKORA’s product portfolio of intelligent diameter gauges by three high-end models. Up to 5,000 measurements per second and axis, all with extremely high single value precision, enable an optimum line control and provide reliable statistical data. The LASER Series 6000 gauge heads measure the diameter of tubes, wire rods and bars with a higher precision and repeatability as well as a wide range of interfaces. Three gauge head models cover product diameters from 0.2 to 78 mm. The measuring values are clearly visualized and the operation is done intuitively at the monitor of the ECOCONTROL systems. At METEC, SIKORA continues to showcase systems for quality control of metal tubes on the basis of X-ray technology. For metal tubes made of aluminum as well as of certain light metal alloys, the diameter as well as the wall thickness are precisely measured. Moreover, the X-RAY 6000 PRO is predestined for the reliable measurement of the plastic coating on steel tubes. Typically, X-ray measuring systems are used for plastic coated steel tubes with a diameter of up to 200 mm. Precise measuring values are immediately retrievable with the online measurement. The data is visualized at the monitor of the processor system ECOCONTROL 6000 and enables the user to intervene into the process if needed. Hence, SIKORA’s measuring systems are essential components for the assurance of the highest quality and an efficient process during production.